What can you do with old PCs? Well depends what you want to do. I have a lot of SCSI based equipment, at the moment they connect to my main DAW PC. This of course is not ideal. My main SCSI units are my EMU ESI samplers. And they are also my main reason for this article. Is it possible to breath life into an antiquated PC? So I had this idea a week ago, find an old pc and set it up for sending samples to my samplers. It had to be able to run propellerheads Recycle and maybe an audio editor. I then decided that if it can run the SCSI card to do the job of communicating with the ESI sampler, then maybe it can also run my SCSI CD burners. So the PC has to be able to run Recycle, possibly wavosaur or audacity and hopefully Nero burning software. Software will be kept down to a minimum to save on space and clogging the system. ***DISCLAIMER: Before you go ahead you’ll need some basic knowledge of how to set up networks and how to adjust your bios. You’ll also be possibly installing software and hardware dependent on what you want to do. Graveyard stuff this, 4.3 gig hard drive installed with Windows 2000. Weirdly with only 128meg installed it starts up quite fast. Noisy but fast. Strangely on the day I take ownership from one friend another friend gives me a second ancient desktop which has been in his garage. Curiosity as always kills the cat and I’m a curious little bugger, I plug it in and it blows. Not big but a pop all the same. I open it up and see rust all over the inside and on the fan of the processor. Lesson there, if in doubt open it up and take a looksy before you plug it into the mains. Two sticks of 64 meg and a 10 gig hard drive are salvaged and in working order. So in they go into the Kayak. Extra ram from the rusty death trap give me over 240meg of ram in total. The salvaged hard drive gives me an extra 10gb of storage space. I install two SCSI cards, an adaptec to communicate with my samplers and a generic one to control the two CD burners I have removed from the DAW. I’ll install an M-Audio Audiophile 2496 as it’s sound card as that will work with a low spec PC and my EMU 0404 won’t. The Audiophile 2496 will give me digital, analogue and midi inputs and outputs. Allowing me to use this desktop as my sampling and editing machine for the samplers. Sharing the keyboard is an issue, KVM switches are quite expensive and space becomes a desktop issue. 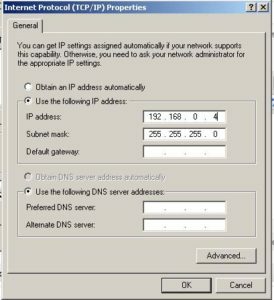 So how about using a lan connection? Apparently a VNC based software program will allow you to do this. Problem arises with a pc not having a keyboard plugged in it will fail to start. To fix this we can try and disable keyboard and mouse in bios if you are able to or set it to halt on no errors. With VNC it will boot without a keyboard if your bios allows it. The Kayaks Bios does not have that function available. In fact there is nothing regarding the keyboard or mouse. This presents a problem, to find an update if one is available and wether or not to risk flashing the bios. Seems there isn’t a bios update, need to find a keyboard. Had a look around and it looks like I’m going to have to have a spare keyboard at least, no bother though it’ll easily be stored somewhere. So before I begin again, let’s make that known. A second keyboard will need to be connected in order for the PC to bootup. I’m pretty sure all PCs make ane error noise when no mouse is found but still enter windows. Before I begin though, installing the EMU ESI sampler and making sure it works is the main reason for this experiment. So best check it does work. I connect the Syquest Drive and the ESI via the Adaptec Scsi card. Turn on windows. First connection finds the EMU ESI and Syquest but software(recycle) doesn’t see them. So now I remember, ASPI drivers. Download from here @ chicken systems. Now the old dog sees the rabbit – the PC sees the Sampler and Syquest. Cushty. Back to connecting my two pcs. 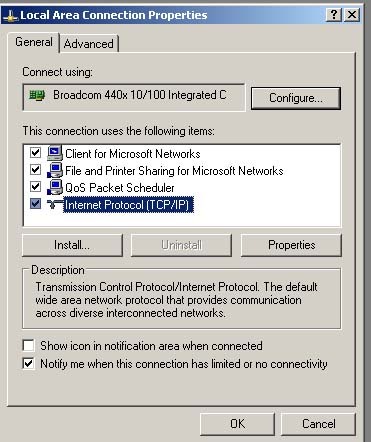 Setting up a network between the 2 pcs – Old Dog w/Windows 2000 <-> New Dog=Laptop /w XP. You’ll need a cat 5 crossover cable and both PCs should have LAN cards installed. I have two 100/10 cards – this should be adequate – if I wanted to I could connect using two 1000/10 cards. It’s not really an issue for me to do that at the moment but who knows what will happen in the future. Setting up a network is really quite simple, but if you have no idea you’ll need to do some reading up on that, it’s one of those things that works differently for everyone in my experience. Also you’ll need to give each of your PCs a static address. 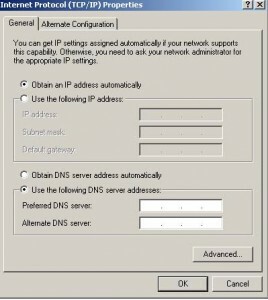 The ‘IP’ address should be different than any already on your network. The only number that you need to change here is the last number. In this IP we have ‘4’ the rest stay the same this should be changed. 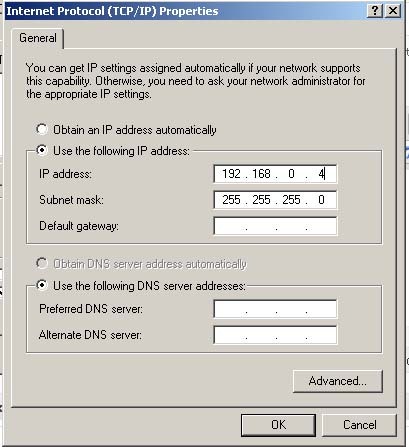 ‘Subnet Mask’ – This will update automatically. 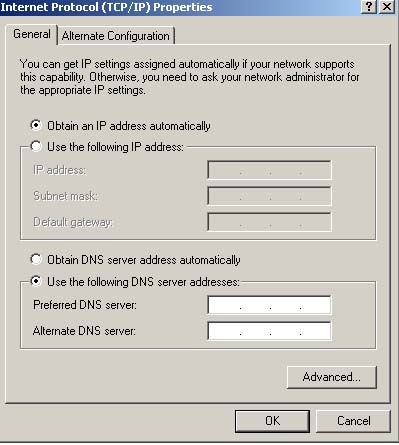 You should do this on both PCs – also be aware, if you intend to use a laptop or PC that connect to the internet you may have problems connecting to the web whilst being networked in the above way. This will fix itself when you disconnect. Or at least it does on my Laptop which connects wirelessly. Restart each machine and check that they connect to each other. If everything works ok and the two pcs connect then we’re ready to install our software. This is the software I installed, I downloaded it from above site. Again this being advanced noodling you’ll need to either read the instructions or just go for it. Restart each PC when it has installed. On the PC we want to log into we will also need Tweak UI Powertoys – to enable auto login. When you’ve installed TweakUI you can go to *Control Panel* and TweakUI – with that software change you’re logon option to auto. To test your system unplug your monitor from the ‘Old Dog’ and restart both pcs wait, go and make a coffee or something – give it enough time. Then try and logon using TightVNC if no joy then check your pc – you’ll need to reconnect the monitor again. Hopefully you’ll now be able to control the old dog with the new dog.